Today is Wednesday, April 17th, 2019, and these are your news and notes. There were four contests in NHL action yesterday and TXHT has all of your recaps for those contests. The Columbus Blue Jackets defeated the Tampa Bay Lightning yesterday with the 7-3 win. Dickson Kendrick has your full recap of the contest between Columbus and Tampa Bay at the link below. The NY Islanders defeated the Pittsburgh Penguins by the score of 3-1 and in doing so won this series and advance to the second round of the Stanley Cup playoffs. Chris Vasilas has your full recap of the contest between the Islanders and the Penguins at the link below. The NY Islanders advance to the second round of the Stanley Cup playoffs and await the winner between the Washington Capitals and the Carolina Hurricanes. The Winnipeg Jets tied their series with the St. Louis Blues with a 2-1 win in overtime. Winnipeg will look to take the 3-2 series lead when Game 5 shifts back to Winnipeg. Aryan Weisenfeld has your recap of the contest between the Winnipeg Jets and the St. Louis Blues at the link below. For more news, notes, information, and stats, you can check out the NHL’s Morning Skate report here. 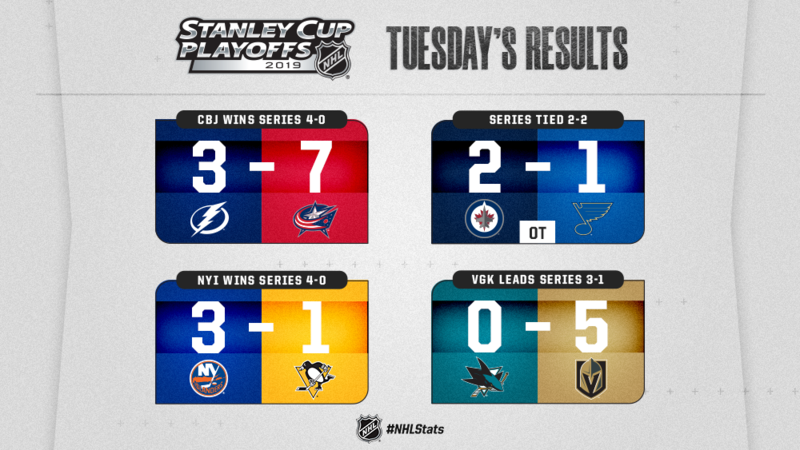 You can check out all of TXHT’s 2019 Stanley Cup playoff coverage here.